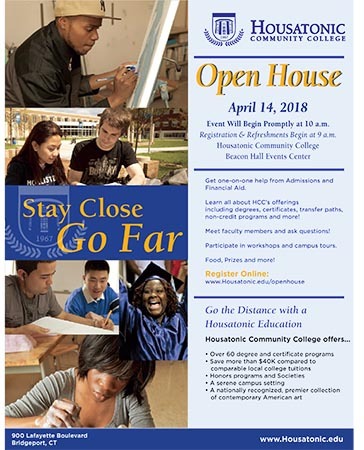 Open House will be held on April 14, 2018. Event Will Begin Promptly at 10AM at the Events Center in Beacon Hall. Registration & Refreshments Begin at 9 a.m.
Get one-on-one help from Admissions and Financial Aid. Learn all about HCC’s offerings including degrees, certificates, transfer paths, non-credit programs and more! Meet faculty members and ask questions! Participate in workshops and campus tours. Food, Prizes and more! What semester are you interested in applying? Go the Distance with a Housatonic Education!